More of the gifted inks from Beth Treadway. Doesn’t color just make your day? 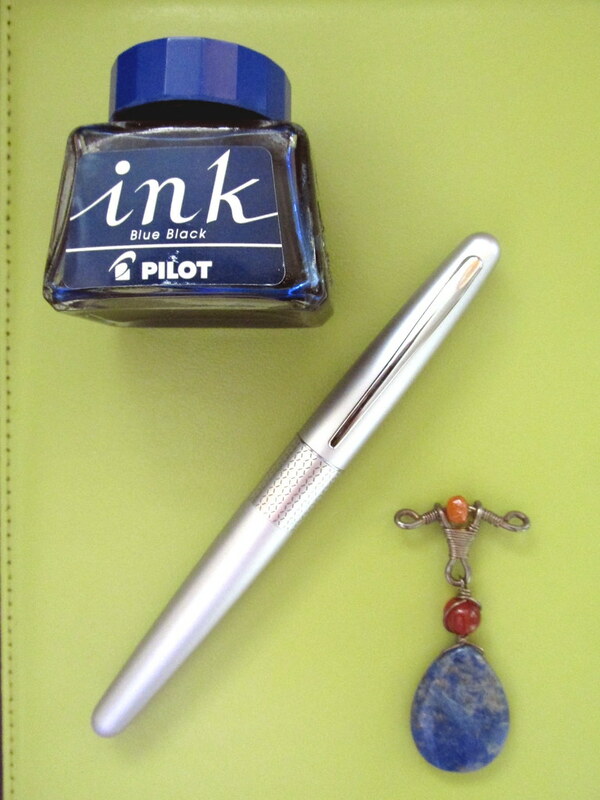 Sometimes the inks in my rotation do a little ink dance in my daily journal. The steps consist of the ink name plus a doodle that shows the ink color to good advantage. 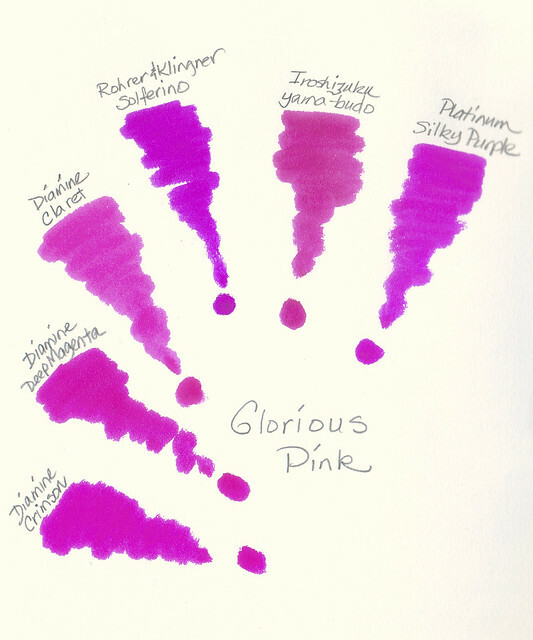 My most recent ink and pen duos were chosen at random and include a few favorites plus several inks that warranted testing in pens different from their last outings. None of those former couples were wedded but rather suffered ill-fated flings. Time to be a bit more successful at matchmaking. To my surprise and without planning, my rotation took on the colors of autumn. I have no idea how that happened but the result is quite pleasing. 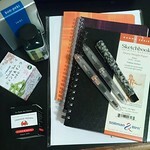 Notes: Montblanc Racing Green has been discontinued and Noodler’s FPN Dumas Tulipe Noire was a limited edition release. 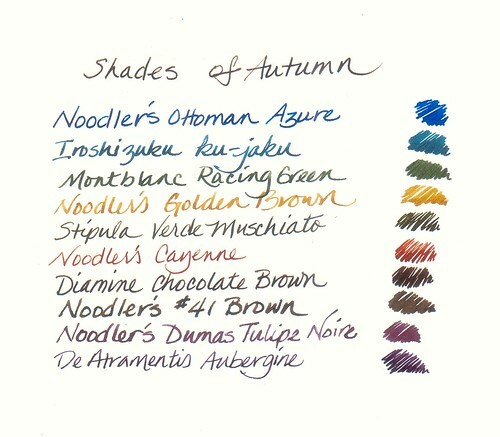 Noodler’s #41 Brown is the original formulation – not the one currently available. The Pilot pocket pen was made in 1976 but all of the other pens are current models. The paper is Strathmore Windpower Sketch. It’s a bit toothy for fountain pens but excellent for swabs and doodles. Staples Filler Paper – Will It Work For You? 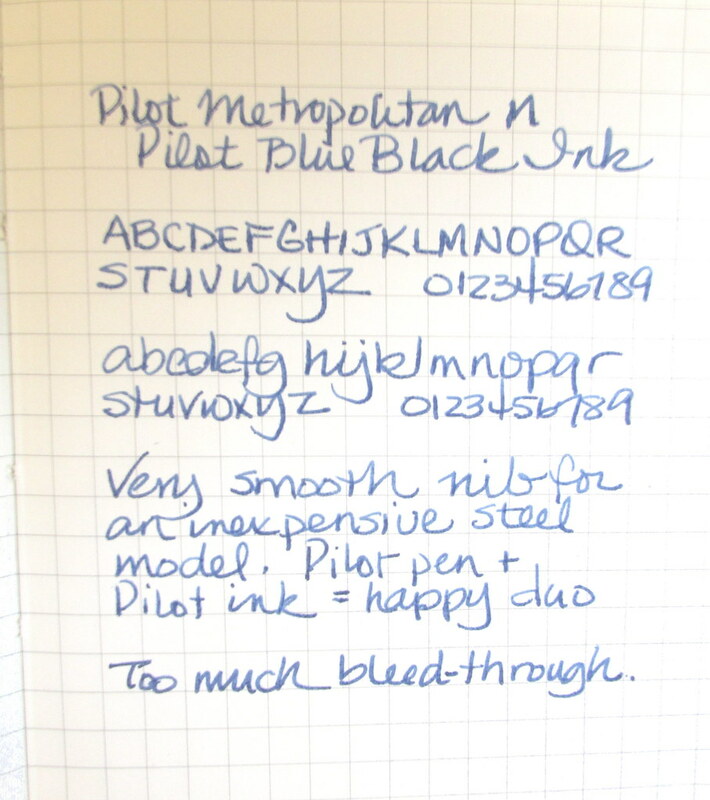 Ruled filler paper that plays well with fountain pens can be a challenge to find. Bagasse or pineapple paper has been the best inexpensive product on the market for the last few years but it is in short supply. Last night at Staples I could only find the ringed notebooks and the wide-ruled composition books. The filler paper is long gone and not expected to return. So what’s a fountain pen aficionado to do? 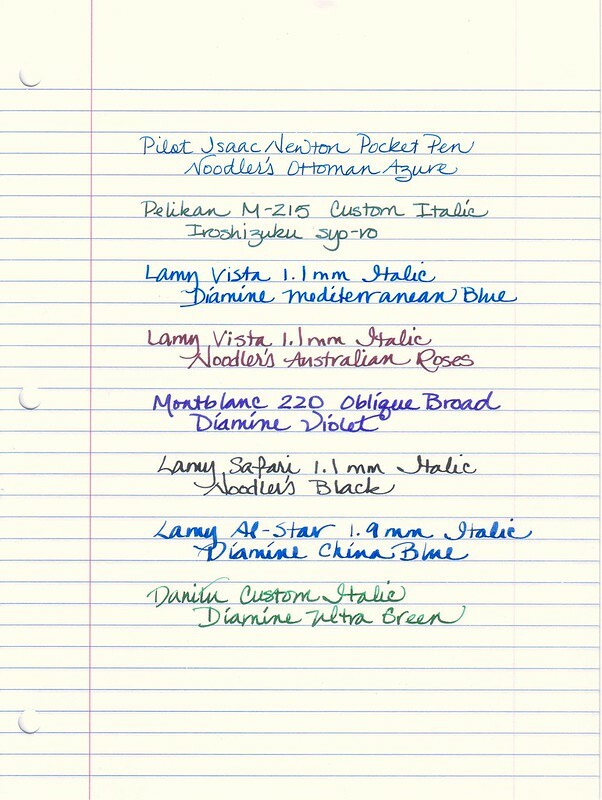 A recent discussion at Fountain Pen Network piqued my interest in Staples College Ruled Filler Paper so I bought a packet and put it to the test. The results were a little mixed but for most people it should work well enough. The only less than perfect ink was Diamine Ultra Green but I’ve seen it feather on Apica with the same free-flowing pen. It is a small amount of feathering but to a perfectionist, it might be annoying. The paper is smooth and light weight. All inks displayed show-through on the reverse but not so much that I couldn’t write legibly. Again Diamine Ultra Green was the exception and bled through too much to write on the back. I love the swathe of green but have concluded this ink is not the best for general purposes. 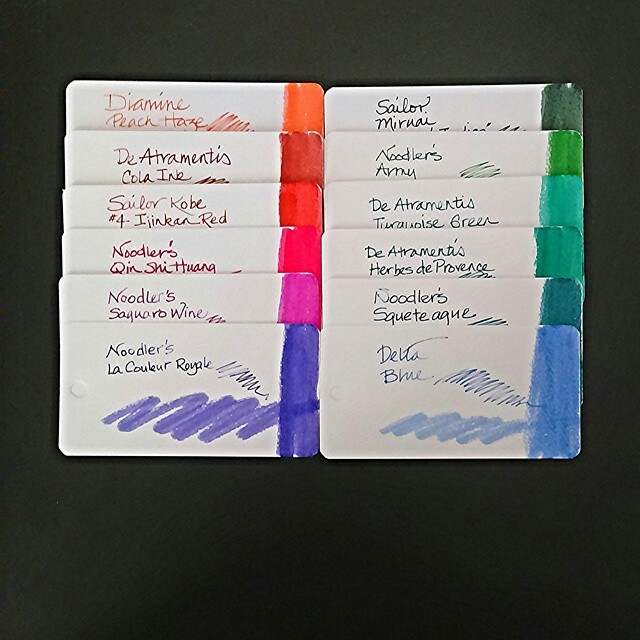 Noodler’s Ottoman Azure and Diamine Mediterranean Blue suit the red margin and blue lines nicely. Other inks had no issues but I like those two blue inks best for this paper. At 75¢ for 120 sheets, it is easy to put this paper through your own test. Note that the packet I purchased is marked ©2012 to the left of the bar code and was made in Brazil. Product from other regions may not perform similarly. Don’t take the scan as a good representation of ink color. It is unadjusted, unfiltered, and served without prejudice so you can reach your own conclusions about Staples filler paper. If you haven’t visited FPN recently, they’ve expanded and made it easier to find things that will surely appeal to an inkophile. Just for fun here are a few of my favorite inks. Note that the swatches are imperfect and a bit pale. 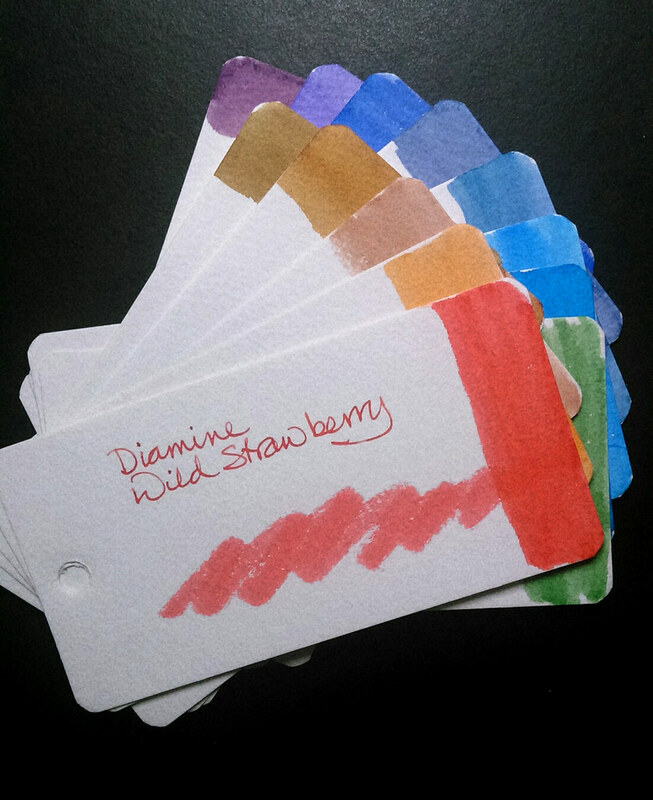 Even so these inks are awfully pretty and frequently in my rotation. Martha Stewart is famous for a lot of things but I must say her robin’s egg blue/aqua color is the first thing I associate with her name. Her beautifully composed rainbow follows just behind. The Martha Stewart line of home office products from Avery and carried exclusively at Staples celebrates the best of her color sense. Even the red, usually my least favorite color, hits the mark. Mix and match or go monochromatic at your desk for an inspiring, creative environment. There are far too many items to cover here so check out the website for the entire line. Everything I picked up was made in China and much of it cello-wrapped, so I cannot vouch for paper quality beyond the items purchased. However, there were no obvious imperfections and that is encouraging. Chinese paper is a hit or miss thing so I purchased two vastly different items to compare quality against similar items on the market. The first product is a stitch-bound cahier notebook (small journal with a flexible cover) and the other is a packet of sticky notes. Both are notoriously poor performers with fountain pens so that makes them highly suitable for ink and pen tests. 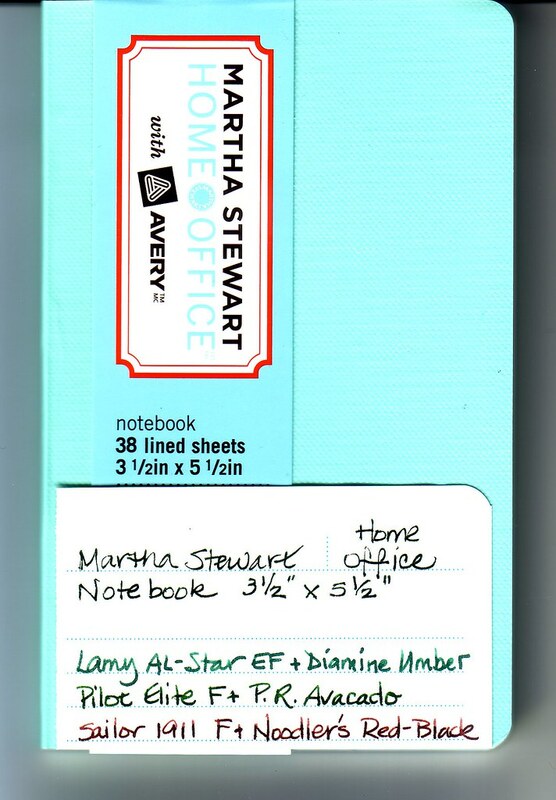 The Martha Stewart Notebook has a Personal Reference page in front for contact information should your journal become lost and two pages listing holidays for 2012-2014 if you really must plan ahead. The closer for me is that every sheet is perforated so notes can be detached without spoiling other pages. Finally, somebody understands my work flow. Also worthy of note is that this cahier has a textured cover, sewn binding, very smooth paper, and will lay perfectly flat without any fuss. The exterior label detaches leaving an unmarked cover, one that is more sturdy than comparable products. On the downside the paper is thin enough to suffer the same show-through and bleed-through as a Moleskine. However, it is closer to white than Moleskine and, at least in the aqua journal, the lines are the same blue as the cover and dotted rather than solid. Looking at the two journals, the Moleskine gives the impression of vintage goods while the Martha Stewart Notebook looks cheerful and contemporary. The latter does come in black if you prefer to split the difference with a conservative cover and modern interior pages. Now for the sticky notes and at this Ms Stewart wins over traditional Post-its though with one caveat. 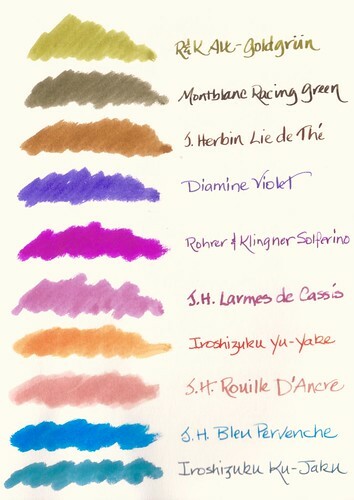 Diamine Umber took about 4-5 seconds to dry so if you must affix your note immediately, avoid touching the wet ink. Not a deterrent for me since I was able to use a fountain pen without losing the vibrancy and other characteristics of my jewel-toned inks. 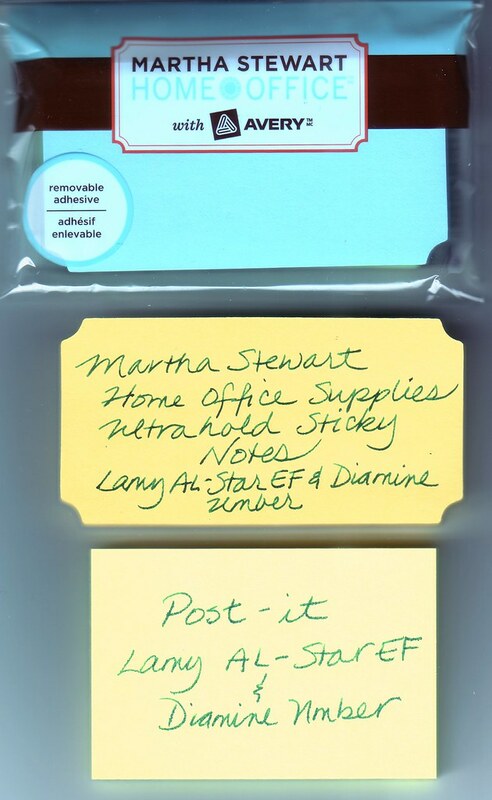 These sticky notes come in decorative shapes and adhere well. I’m sold. The Martha Stewart products are priced slightly above some lines but lower than others. The 38 sheet notebook and the 3-pack of sticky notes cost $2.99 each. There are quite a few paper items in the line including journals, notebooks, and pads. I have only tested two so this is not an endorsement of products except those tested though two for two is very encouraging. With spring flowers blooming and the weather warming, a bit of cheerful color at my desk is very welcome and it might be fun to add a few more touches of Martha Stewart color to my otherwise neutral workspace. If so, I’ll let you know how they measure up to the competition…if they even have any. Now for a few words about my shopping excursion. Cover your ears if you are a big fan of Staples. There isn’t much that wows me there, sugarcane-based paper being the exception. Perhaps it’s just the local store in Glendale that is understaffed and poorly laid out. Really now. Who would place the extensive line of Martha Stewart Home Office Supplies with the computer equipment rather than front and center with the office supplies? It was only by luck that I happened to catch the aqua color and wander over to find the display. To make comparisons to similar products I had to walk back and forth across the store numerous times. Finally in frustration I grabbed a couple of the Martha Stewart items and headed for the checkout only to wait and wait in a long queue at 2pm on a weekday. Sheesh!